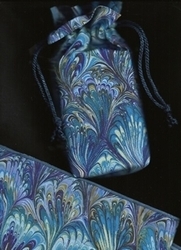 Double Draw Tarot Bags - Mulberry Peacock DD Bag - Tarot Bags, Tarot Cards, Cloths, & More! 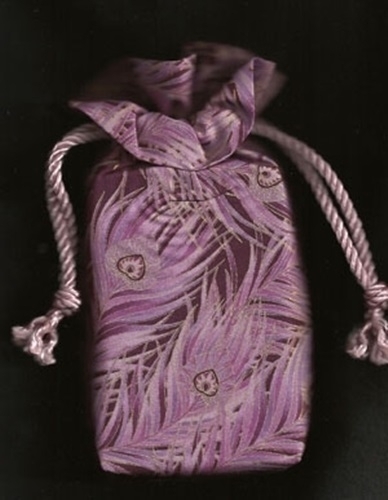 Accented in gilded gold, this eye-appealing tarot bag was made from a designer fabric of elegant peacock feathers in shades of orchid and lavender. Size: This tarot bag is 7-1/2 x 5 x 1 inches. It fits most standard sized tarot decks that are up to 3-1/4 x 5-1/2 inches. There is an one-inch ruffle on top and an one-inch gusset (tote style) at the bottom. It is made of cotton and closes with two drawcords made from 34 inches of twisted rope decorator cord. The tips of the amethyst cords form small tassels. Please note the cord color shown in the picture (pink) is no longer available. This bag now comes with an aubergine (eggplant) cord. 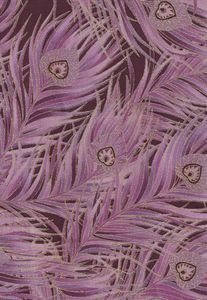 Color scheme: Wine background with feathers in orchid, lavender, amethyst and pink. Peacock eyes and feather tips are gilded in metallic gold.